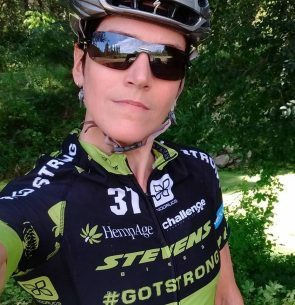 Christine “Peanut” Vardaros is a Belgium-based International Professional Cyclist AND Vegan since year 2000. She began her career as a pro MTB’er, before switching over to the pro ranks in road and cyclocross racing. When not on the bike, she is a copywriter/journalist/translator. She spends her free time playing with her deaf kitty Emmy and volunteering as spokesperson for The Vegan Society, In Defense of Animals (IDA), and Physicians Committee for Responsible Medicine (PCRM).